Material(s) / Technique(s): Plaster, painted using the secco technique. Provenance: Syrian Desert; 80 km southwest of Palmyra. Description: The Umayyad desert palaces show clearly the influence of earlier artistic traditions – both from the Byzantine Empire in the West, and the Sassanid Empire in the East, what is now modern Iran. This painting shows the influence of the art and mythology of the Sassanids. It covered the floor of the reception room in the east wing of Qasr al-Hayr al-Gharbi. The lower section portrays a clean-shaven hunter galloping on horseback. The hunter is dressed in Sassanid-style fashion; his head-scarf flying behind him, his bow and arrow are drawn tight for the catch. On the lower right-hand corner is a gazelle, running away while looking back. 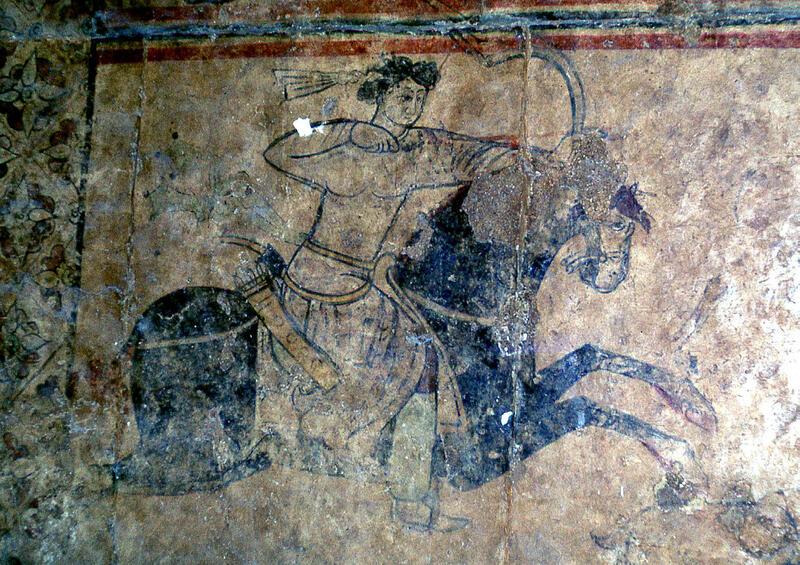 Back to the smaller image of the horse-archer in a floor painting. Umayyad, Qasr al-Hayr al-Gharbi, Syria.